Like the Chinese, We Indians too have the riches of our food for good health . One such secret of good health is the Various Types of Millets that are available in India. 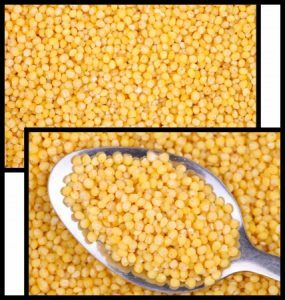 These millets have various Benefits on health, including Weight Loss. As we age, our metabolism slows down. This makes weight loss very trickier. 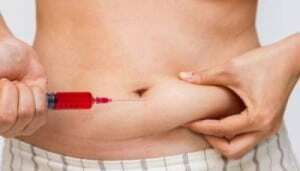 The major reason for this change is decrease in muscle mass. After 20 years of age muscle mass decreases about 1 to 2 % per year. The more lean muscle we have, the higher is our metabolism. To eat is a necessity but to eat intelligently is an art. You need a minor change in your eating habits and activity levels to lose weight. 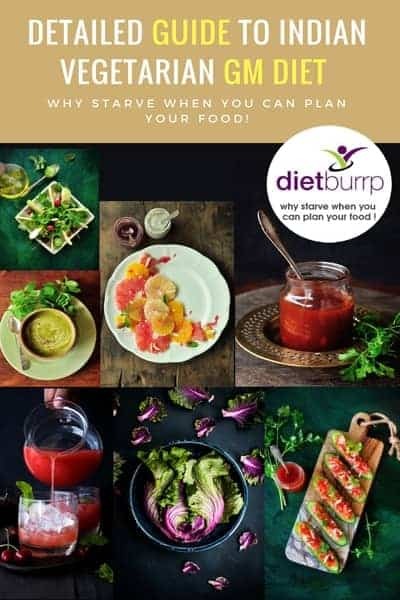 Master the art of incorporating various types of millets without extreme change in your daily staple and experience the magical weight loss. Millets are a group of small seed grasses grown in semi-dry areas of Asia and Africa. Millets are cooked like any other cereal. Indians use it to make rotis, khichdi, porridges, salads, Millets are used in multi grain products, muffins etc. Millet are Gluten free. Millets are high in proteins. Most types of Millets are rich in fiber, which makes your stomach feel full longer. These are gluten free grains. Gluten is found in grains such as wheat, rye, barley, and triticale. People with gluten intolerance or celiac disease can’t digest gluten and this damages their small intestine. Hence, They can include various types of millets in their food routine. It is a rich source of Vitamin E, B complex, niacin, thiamin and riboflavin. In addition, millet also contains essential amino acids like methionine and lecithin and minerals like iron, magnesium, phosphorus and potassium. Jowar is rich in calcium compared to rice and wheat. It also contains iron, protein, and fibre. 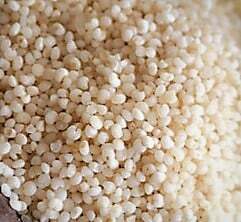 Researchers have found that jowar is rich in policosanols which helps in reducing the levels of cholesterol. Being a gluten-free grain, it is also much preferred by those who can’t tolerate wheat-based products. It has 8 times higher iron content than in rice. It is also rich in protein, fibre, and minerals such as calcium and magnesium. Bajra consumption eases constipation and digestion issues. Being Gluten free, Bajra is super soft on our digestive system, It doesnt load the gut and hence gives a light feeling even after a heavy meal. 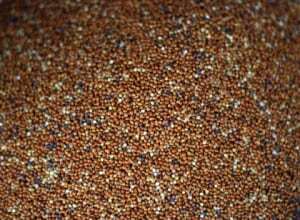 Ragi is the most common amongst various types of millets down in the south of India. Ragi is a better replacement for rice and wheat. It is high in protein, calcium, iron and fiber. It has a low glycaemic index which helps diabetics to keep their glucose levels in check. Malted ragi is advised to kids and diabetics as it has a better absorption and more benefits. It is a rich source of B-vitamins, minerals like calcium, iron, zinc and potassium. 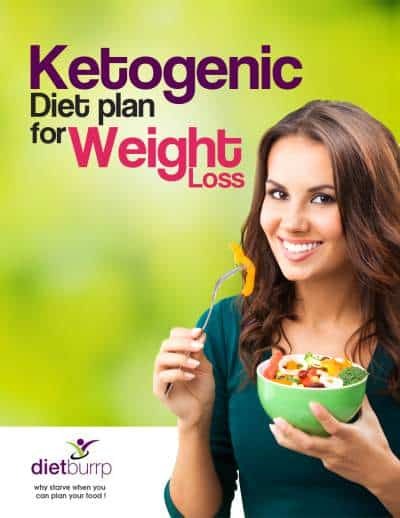 It also provides essential fats to the body, the kind that helps in weight loss. Its high fibre content is also beneficial lowering cholesterol levels. Foxtail millets are found in the form of rice, semolina (like rava) or as flour. Foxtail millet is rich in complex carbohydrates. It is low in glycaemic index and do not show sudden spike in blood sugar levels. It is rich in dietary fiber and minerals like iron and copper. The fiber reduces the levels of bad cholesterol and keeps the immune system strong. It has 6 times more of fiber than wheat making it ideal weight loss millet. The fiber helps in attaining satiety. It is rich in minerals like calcium and phosphorus. This has additional benefit for bone health. It can be used as replacement to rice in dosa/idli/dhokla batters. Millets may prevent Gallstones . The Nurses’ Health Study found that people eating both soluble and insoluble fibre reported 13% lower risk of gallstones. Millets being high in such fiber prevent gallstones. Lignin is a phyto nutrient present that reduces cholesterol and also aid weight loss. High fiber also relieves constipation. High fiber content has good satiety level. Thus, in between meals there are very few or nil hunger pangs. Also, these millets prevent overeating at one time. Some researchers believe that fiber in millets with its antioxidants is responsible for the lowering rate of colon cancer. The presence of amino acid called lysine slows down muscle degradation and helps to build leaner muscles. Millets are therefore not only used for weight loss, but also to gain lean muscle mass. Magnesium is a muscle relaxant. Thus, millets help reduce pressure on arterial walls. This helps in maintaining hypertension. 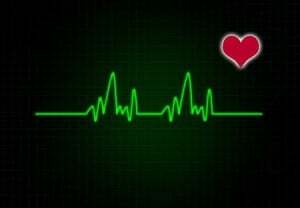 Magnesium helps to relax the muscles that line the inside of your arteries, thus it reduces blood pressure. 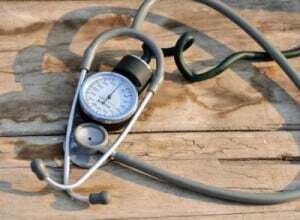 Magnesium improves enzymes action involved in insulin action. They are low in glycaemic index. Thus, prevent sugar surge in blood. The satiation level of millets is high. So, over eating of millets is not possible. All these factors are very beneficial for a diabetic. Millets are rich in antioxidants. It reduces stress in the body. Thus, maintaining the cell structure and elasticity. High antioxidant value means a perfect glowing skin. Anti -ageing foods that help you look young forever. Benefits of Amla on skin. Multani mitti face packs for soft , smooth skin. With the present sedentary and stressful lifestyle, the excessive work needed for proper digestion of millet may be damaging. It might affect the glandular system; especially people with thyroid must be very cautious. Millets contain goitrogens that hinder thyroid function. Better consult a professional before incorporating the millets in the diet. Millets may be best avoided in under functioning thyroid. Millets contain Goitrogens. 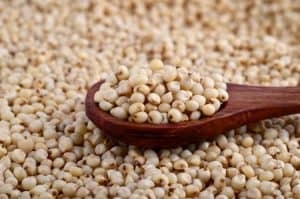 While cooking inactivates the goitrogens in most foods, the goitrogens in pearl millets remain intact even after cooking. 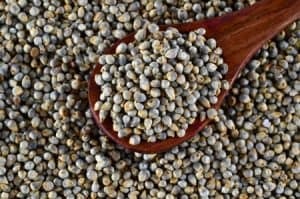 Pearl millet or Bajra interferes with thyroid function whether or not you have iodine deficiency. Hence it is advisable to exclude millets in your diet if you have hypothyroidism. Or only include in moderation. A proper calculated intake of millets with other nutrient rich foodstuffs will aid in desired weight loss. With added health benefits of millets it will be cherry on icing for healthy living. Diabetes patients are advised to avoid rice, wheat which are high sources of carbs and instead advised to make pulses and cereals/millets part of their diet. But, some say that cereals/millets too have GIs close to that of rice and wheat. Hence advice against the use of cereals/millets. What is the correct diet chart for diabetes and the rationale behind such a diet plan? 1. Why don’t you mentioned carbs of millets. 2.Can vegetarian easily build a lean mass as we don’t have lean protein. 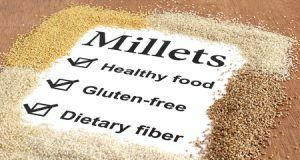 1] millets have good carbs (complex carbs). i have mentioned carbs if they were specifically important of different . 2] yes you can build lean mass if you include whey proteins and other protein supplements along with low carb protein foods like milk , cheese , paneer , skimmed milk powder, soyabean , tofu , soya milk, and almond milk. 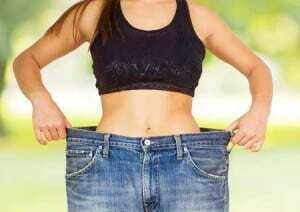 What is the correct diet plan for weight loss?